Start your morning off with a smoothie bowl packed with Vitamin C, antioxidants, fiber and of course a whole lot of flavor! 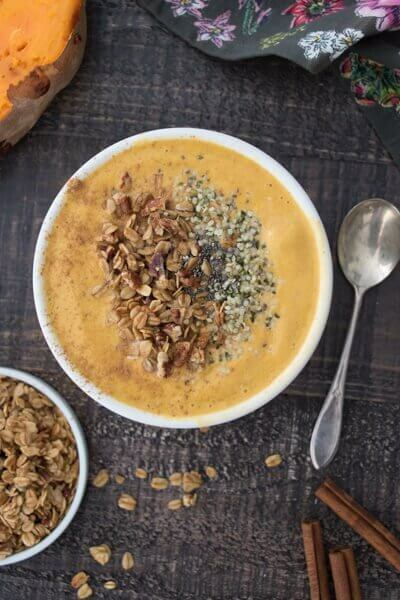 This sweet potato smoothie bowl is just as delicious as it is healthy, even the little ones will be asking for more. In a high speed blender, add the cooked sweet potato, plant milk, plant milk ice cubes, dates almond butter, vanilla cinnamon and nutmeg. Blend until smooth and creamy (about 45 seconds). Add the ice and blend again. Taste and add more ice if you want a thicker and frostier smoothie. You may want to adjust the spices at this time. Pour into a large bowl and top with your favorite toppings. Pictured here I used my homemade Pecan Granola, hemp seeds and chia seeds. Enjoy Immediately. * To cook the sweet potato: Place a baking sheet lined with aluminum foil on the bottom rack of your oven. Preheat your oven to 425 degrees F. Pierce the potato with a fork on one side then place directly on the middle rack (not on a baking sheet and not wrapped in foil). Bake for 40-45 minutes or until tender and the skin is thin and toasty. Baking time will vary based on the diameter of your sweet potato. You may need up to 60 minutes for a large sweet potato. The bottom baking sheet will catch any drippings for an easy cleanup. Remove from oven and pierce with a knife to ensure it is fully cooked. Allow the potatoes to cool for 5-10 minutes for easier handling. Slice the potatoes in half and split the flesh down the center. For this recipe you will likely use one half of the sweet potato (1 cup). You can store the other half in an airtight container for another smoothie. For this recipe you will want the sweet potato to be fully cooled before using in the smoothie so I like to cook it the night before and chill in the refrigerator overnight. ** To make plant milk ice cubes, simply fill an ice cube tray with your favorite plant milk (I used almond milk). Place in freezer overnight. You can use regular ice instead but it will be a thicker and creamier smoothie if you use a couple plant milk ice cubes and it will not taste as watered down. *** You may need to soak your dates in advance if they have hardened or if you do not have a high speed blender that can handle pulverizing dates. To avoid date chunks in my smoothie I sometimes soak them in water overnight to rehydrate them. You can also do a quick soak method and soak them in boiling water for 30-60 minutes before using. The longer they soak the better. Before using, fully drain the dates.